Many industries use water or water-coolant mixtures to protect valuable process machines and equipment from overheating; water chillers are frequently used in these situations in order to maintain a constant supply of chilled water available. Spot welders, injection molding equipment, batch coolers, medical imaging machines, laser cutters and fabrication processes can all be configured to use water chiller systems for temperature regulation. Schools, hotels and other facilities with large air conditioning systems and multiple localized controls often pump chilled water throughout their building to provide climate control where it is needed. In these ways water chillers can help provide a stable thermal environment both for specific industrial processes and for entire facilities. Water chillers use either absorption or vapor-compression refrigeration cycles to produce their cooling effect. Both processes involve a refrigerant that absorbs heat from water as it evaporates and then releases heat into the atmosphere as it condenses. Common refrigerants include ammonia, sulfur dioxide, alcohol, brine, various fluorocarbons and methane. The absorption process uses a heat source to drive the refrigeration cycle, while the vapor-compression process uses a gas compressor to drive the cycle. During the condensing phase, a fluid from outside the system is passed over the condenser coils in order to cool the compressed refrigerant vapor and make it become a liquid again. Water is very effective at this task, but can also complicate the process by requiring a water pump and an outlet for the heated water such as a cooling tower. Air-cooled chillers are simpler, using ambient air to blow over and around the condenser tubes and carry some of the heat energy into the atmosphere. Evaporation-cooled chillers function in the same way as air-cooled chillers, except a mist of water is introduced around the coils in order provide extra cooling by evaporation. Once the refrigerant has been condensed the chiller pumps the liquid through an expansion valve and it begins to evaporate. Here it quickly cools off and starts to absorb energy from the water until it is fully vaporized and finally returns to start the cycle over again. Water Chillers Water chillers are cooling systems designed to facilitate heat exchange from water to a refrigerant and from the refrigerant into the atmosphere. 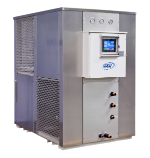 Like most other liquid chillers, water chillers cool through a cycle of pressurization, condensation, depressurization, and evaporation of a refrigerant. Water chillers differ from other chillers in that they are used primarily to cool water for industrial applications.